Family Leisure shoppers turn to Hanamint furniture over and over again, many times coming back one, two and three times for more. And that’s not because the furniture breaks down, but rather, because shoppers grow to know and love the Hanamint brand furniture, and want more of it! Hanamint has several collections that are united by a similar decorative pattern. One of the most popular collections is the Grand Tuscany collection, which features the pattern you’ll find on the seatback of the Grand Tuscany Double Glider. 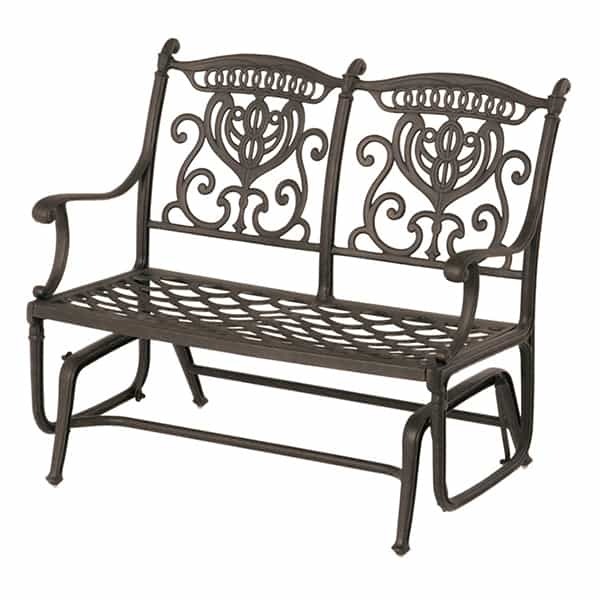 The ornate pattern is matched by the scrolling armrests and may be paired with any cushion cover fabric you choose. The double glider is made to seat two people, give or take, depending on size! The seat is not stationary, but rather glides forward and back. The aluminum chair weighs 74 pounds to guarantee stability and longevity. You may rest easy with the investment, as the glider bench is backed by a generous 10-year warranty from Hanamint. Cushion Fabric You choose! Please call.